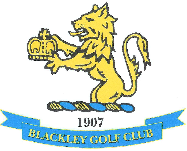 Less than 5 miles from the centre of Manchester, Blackley Golf Club is easy to find, lying as it does between junctions 20 and 21 of Manchester's orbital M60 motorway. Blackley is a great venue for visitors from all over the north west. If you are traveling round the M60 clockwise, exit at Junction 20, turn right at the end of the slip road and then after a row of shops on the left turn left at the lights, at the Tesco store onto Victoria Avenue East. Carry straight on until you see flats on the right and then with the Academy also on the right, turn left immediately before the Pure Gym. Follow the driveway up and over the motorway bridge and into the clubhouse car park. Traveling counter clockwise exit at junction 22. Go straight on at the end of the slip road, passing Morrisons on the left, straight through next sets of lights (Whitegate Pub On Right). Continue down Hollinwood Avenue, (shops on both sides) until the roundabout. Straight on at roundabout (3rd exit). Continue on Victoria Avenue East 1/4 mile and turn immediate right after Pure Gym. Follow the driveway up and over the motorway bridgeand into clubhouse car park. If you are lucky enough to be using a SATNAV system to find us our postcode is M9 7HW .